So carrying on from my post yesterday about surviving onsite, we have discovered another way to help the days go quicker when we're bored. And that is, what my workmate and I affectionately refer to as the Crap Bag. 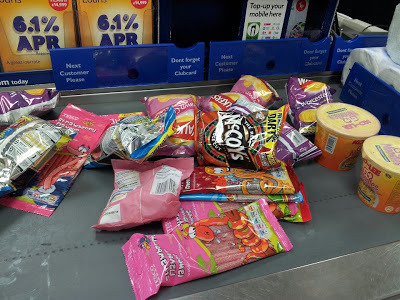 Usually it consists of stuff along the lines of dirty instant noodles, loads of crisps, snack a jacks, 2 or 3 varieties of biscuits and a crap tonne of sweets. Here is a pic that I took earlier this year when we were onsite. 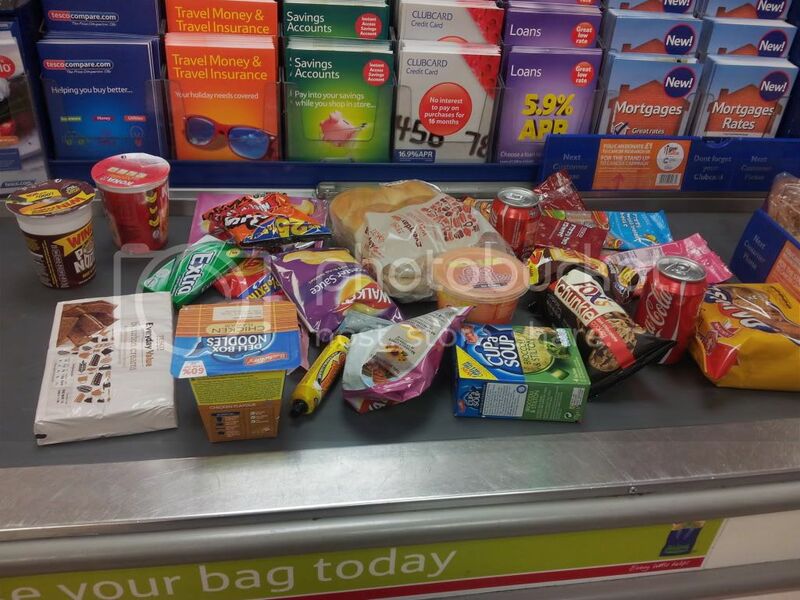 I posted it on facebook with the caption 'Conveyor Belt of Win' and my brother for some reason found this hilarious. Sometimes when he is eating crisps he'll just say to me "conveyor belt of win?". How I got this through expenses I still don't know! This time, I think we surpassed this!! Crap bag. I like that! Omgz, Walkers Prawn Cocktail are vegan?? How did I miss that? I'm off to the shop! Aaaargh you found those biscuits AGAIN. I still haven't seen them anywhere! You say bag of crap, I say aren't biscuits one of your five a day?